CHARLESTON, SC - Tuesday nights at Joseph P. Riley, Jr. Park this season have consistently featured Harris Teeter and its 2-for-$20 Date Night Special for couples to enjoy a fun night of Charleston RiverDogs baseball. For the final two Tuesday games at The Joe, the RiverDogs are partnering with Harris Teeter to host a special food drive to benefit the Lowcountry Food Bank. 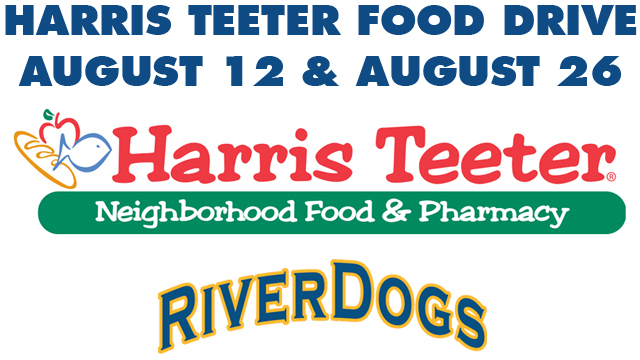 The Harris Teeter Food Drive is scheduled for Tuesday, August 12 and Tuesday, August 26 at Riley Park, coinciding with RiverDogs games that are scheduled for 7:05 pm. Fans who bring at least two non-perishable Harris Teeter brand food items to the Riley Park Box Office for either of those games will get $2 off any individual ticket. The Lowcountry Food Bank will receive all of the donations from this food drive. "The RiverDogs are always proud to partner with Harris Teeter, and we are thrilled to host this food drive during our final Harris Teeter 2-for-$20 Date Night Tuesdays from Nash FM," said RiverDogs General Manager Dave Echols. "The Lowcountry Food Bank has also been a big partner through our HOPE Week initiative and our 'Smokin' Chef' series on Sundays. We fully encourage our fans to join the fight against hunger when they come to these Tuesday games." In addition to fan donations on August 12 and August 26, Harris Teeter will also donate 50 cases of canned food to the Lowcountry Food Bank. The $2 ticket discount for fan donations may not be combined with the Harris Teeter 2-for-$20 Date Night Special. Couples that show a VIC Card at the box office may receive the Date Night Special, which covers two tickets to the game, two tacos, two fountain drinks and a nacho tray for only $20. Charleston continues an eight-game road trip Wednesday with a doubleheader at the Savannah Sand Gnats that starts at 5:05 pm. The RiverDogs have 10 home games remaining in the regular season, including postgame fireworks displays on Friday, August 15 and Thursday, August 28. For more information or to order tickets to any RiverDogs game, visit the Riley Park Box Office, call (843) 577-DOGS (3647) or head on-line to www.riverdogs.com. If fans cannot make it to the ballpark, they are encouraged to tune in to all the action this year both home and away worldwide on www.riverdogs.com and locally on 1250 WTMA, the new radio home for RiverDogs baseball. The Lowcountry Food Bank serves the 10 coastal counties of South Carolina and distributes more than 19 million pounds of food a year. The Lowcountry Food Bank is a clearinghouse for donated food products that are distributed to a network of more than 320 member agencies including soup kitchens, homeless shelters and emergency food pantries. The Lowcountry Food Bank is a member of Feeding America and is committed to educating the public about the problems of and solutions to domestic hunger as well as advocating on the behalf of the hungry in our community.